Before the Mark Teixeira deal we were fairly certain that Nick Swisher would be playing everyday at first base. This made predicting the Yankees outfield fairly simple (before any new trades or free agent signings). Johnny Damon would be the regular left fielder, Brett Gardner and Melky Cabrera would share center field, and Xavier Nady would play right field. Hideki Matsui will be the everyday designated hitter and an extra outfielder. That gave the Yankees five outfielders which is the number that most teams carry on their 25-man rosters. Teixeira is now the first basemman. This means Nick Swisher must get most of his at-bats as an outfielder. Swisher has played center field in the past but his defense there leaves much to be desired. One of the under reported aspects of the changes the Yankees are making this offseason is the improvement to the team defense which was not very good during the 2008 season as measured by UZR. The 2008 Yankees defense was -39.4 runs as measured by UZR, 28th in baseball. Two large factors in that measurement are no longer on the team - former right fielder Bobby Abreu (-25.9) and former first baseman Jason Giambi ( -2.5 ). 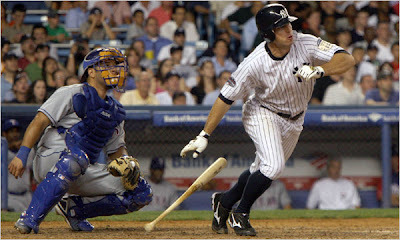 Giambi has been replaced by Teixeira who was the best first baseman by UZR/150 at +10.1 in 2008. The Yankees also want to upgrade their outfield defense. This makes the best possible defensive outfield for the Yankees -- Johnny Damon in left field (19.9), Brett Gardner in center field (40.2) and Nick Swisher in right field (14.2). But obviously the Yankees also need to consider offense which was not what they were expecting in 2008. Since Matsui is likely the DH is any case we'll place him there and take him out of this part of the discussion. Johnny Damon is clearly the best candidate for left field when we combine his offense and defense and his likely role as the Yankees leadoff hitter. Melky Cabrera's track record of lousy offense should remove him from the conversation as well. His defense just isn't good enough to justify an everyday role while contributing zero to the offense. Xavier Nady's defense in center is much worse than Gardner's and Swisher's so he is not a candidate to play center field. Brett Gardner's offensive potential and superior defense makes him clearly the best possible center fielder for the Yankees. This creates a battle for right field between Nick Swisher and Xavier Nady. To this point most have assumed that the Yankees' most like Spring Training battle would be between Melky Cabrera and Brett Gardner for center field. I think it isn't a contest. By the numbers, Gardner is the far superior option. This makes the biggest battle of the spring between Nick Swisher and Xavier Nady. Swisher seems clearly the better defensive option but Nady is not a detriment in right field. The real question is what is the true offensive level of both players. If we believe that Nady's gains in 2008 are for real then Nady gains an edge on Swisher. However, if both revert to their career levels of performance Swisher becomes a slightly better option especially when defense is considered. Both Swisher and Nady have demonstrated the ability to play multiple positions. Nady is competent at first base, and both corner outfield positions and Swisher adds center field to his versatility. Nady has an .863 OPS against lefties during the last three seasons and an .810 OPS versus right-handers. Swisher also is better against left-handers with a .864 OPS and a .799 OPS against right-handers. So a platoon doesn't make much sense. Unless Melky Cabrera is absolutely amazing in Spring Training he will not be on the major league team to start the season. Xavier Nady will be the regular right fielder. Brett Gardner will start in center field unless he is attrocious in Spring Training. Nick Swisher will utilize his versatility to find 350-400 at-bats rotating between left field, center field, right field, first base, and designated hitter. If Hideki Matsui is not the designated hitter, he will not be in the lineup. The rumors of Manny Ramirez also coming to the Bronx are still out there but I think this is an unlikely development. Much more likely is that the Yankees complete their much rumored trade for Mike Cameron. Cameron would start in center field and throw everything off again. The other very strong possibility is that the Yankees do what they usually do and begin the season with the veteran Nick Swisher in center field. In this scenario Brett Gardner would be the reserve outfielder to start the season. Even if this is the case I believe that (to use a battered cliche) the cream will rise to the top and Gardner will be the regular center fielder by the all-star break. Gardner is simply too talented too remain on the bench in favor of inferior defensive (and potentially offensive) options based on nothing but veteran status. Brett Gardner is one of my favorite sleepers for the 2009 season. I will be posting my complete evaluation of his skills in the series of sleeper articles that should appear in the next few weeks. Excellent analysis. I may try to trade for Gardner in my keeper league. Thanks Dave, I think that's a great idea, obviously. Why keep Brent Gardner on the bench? he is still somewhat of a prospect and isn't going to learn anything riding the pine. Send him to AAA where he is going to get at bats and an opportunity to up his game. 4th outfielders can be acquired relatively cheaply or keep Justin Christian at the MLB level. He has a decent defensive and base running skill set and he's 28, not a prospect. Christian is what he is a career minor leaguer and back up outfielder. Bubba Crosby for lack of a better analogy. If an injury occurs, then you bring Gardner up to play full time. Just my two cents... Great job though. Thanks a lot for commenting. If Gardner doesn't win the starting job, AAA is definitely a possibility. But in 2008 the yankees seemed willing to have him on the bench. I think he would play frequently from the bench as a pinch runner/defensive replacement. Its through those at-bats that he eventually wins the job in that scenario. If we go with an offensive lineup (i.e. an OF of Damon, Swisher, Nady). Why would Swisher play CF over Damon? Damon is just below average in CF, Nady just below in LF, and Swisher is well above average in RF. I think if Gardner can provide decent offense he is our best option to start in CF, but if not Damon and NOT Swisher is the next best candidate. Melky even with a rebound year isn't much of an option. You're right. If I said otherwise it was a mistake. I also agree with you on Melky Cabrera. 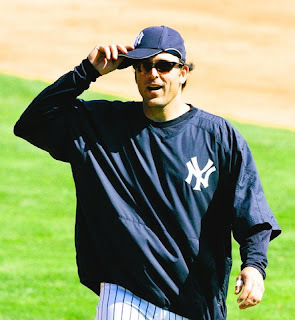 However, I'm not certain that the Yankees are as ready as we are to move on.